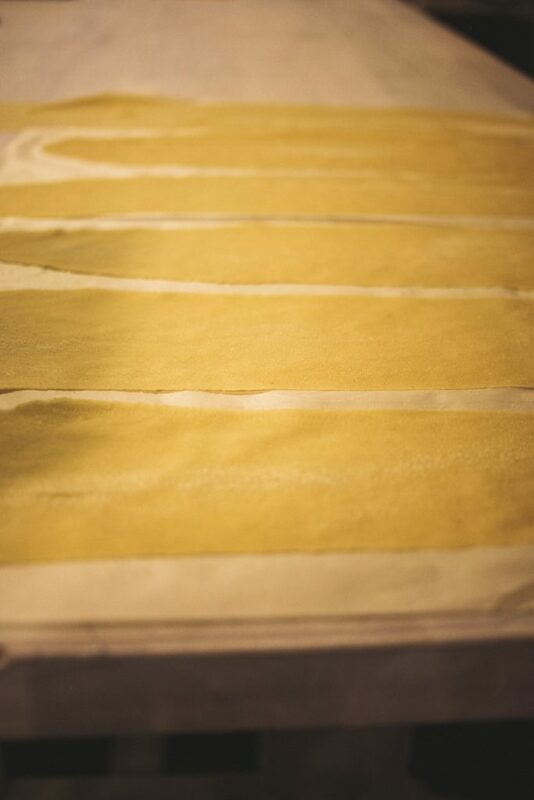 The process of making pasta is a somewhat therapeutic one. 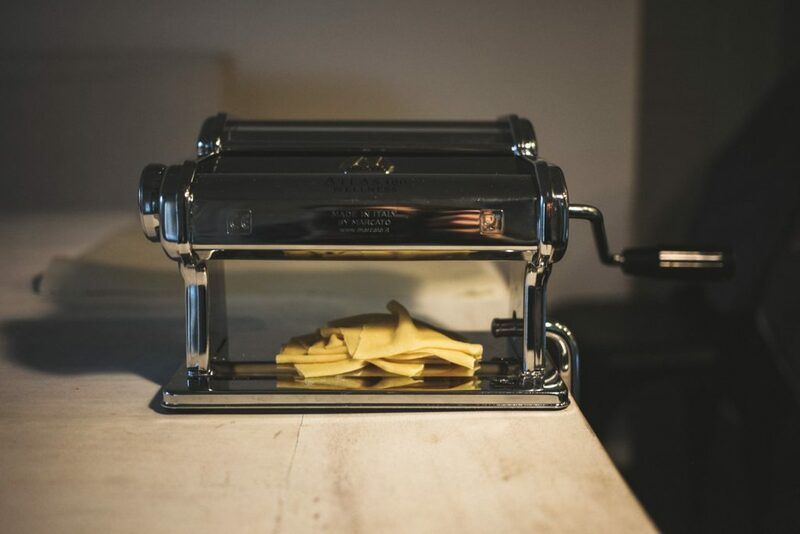 Using your hands, kneading the dough, rolling the pasta through the machine, it’s all so manual, simple. Which is another reason that I love fresh pasta! Start with an even mix of all purpose and semolina flour. I have made this before with just all purpose flour but semolina flour is definitely best. Make a small mound and crack the eggs into the middle. 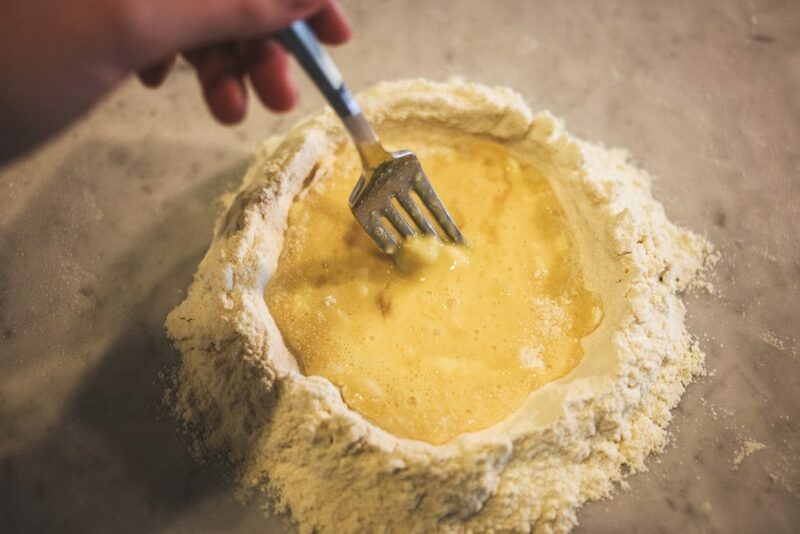 Using a fork, mix the flour into the egg gradually until it forms a dough. 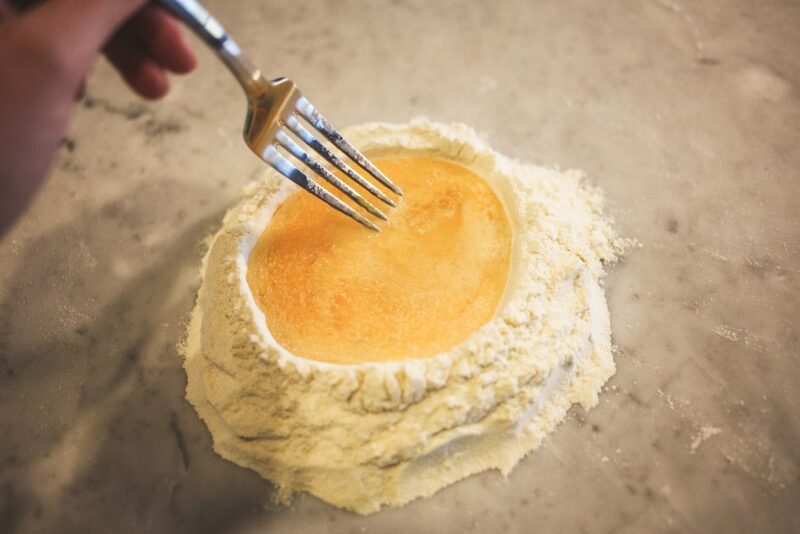 As the dough starts to form, you can use a dough scraper to bring it all together. Don’t be bothered too much by measurements, I just mix it all together until it forms a very smooth, not sticky dough. If there is extra flour left over, don’t try to force it in. You don’t want it to be too dry or it will be difficult to work with. If you are not going to use the pasta immediately, wrap it up in plastic wrap. You can refrigerate it up to 2 days or so but make sure you let it sit at room temperature before rolling it out. Use the dough scraper to cut into small workable pieces. 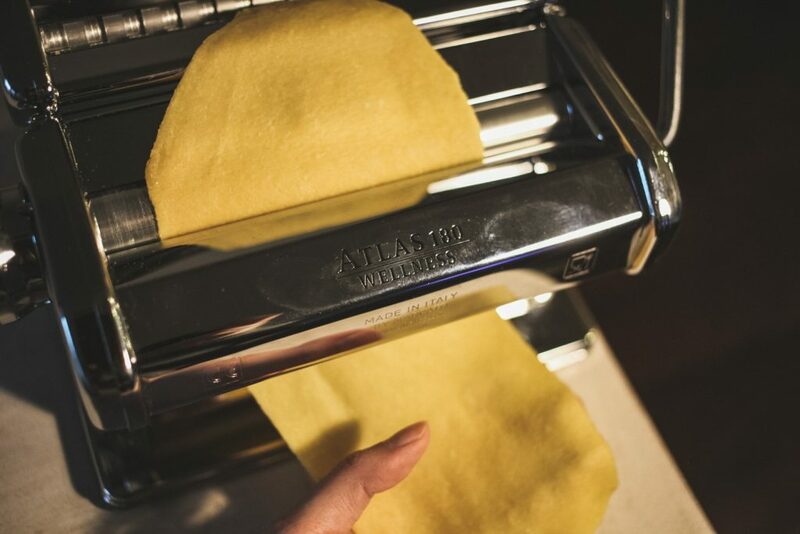 I absolutely love my Atlas Pasta Maker because without it, it is hard to bring myself to go through the whole process of making pasta. 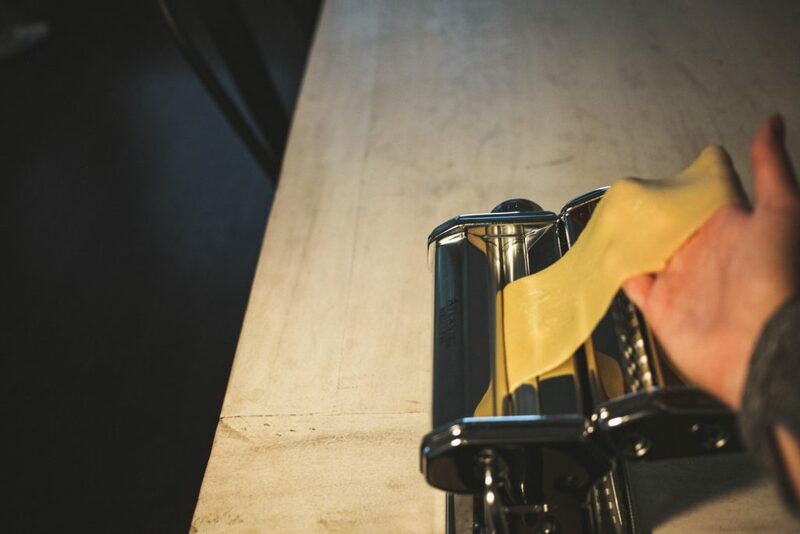 Without one, you have to roll the pasta as thin as possible with a rolling pin which is extremely difficult and then slice the pasta thinly with a knife. It probably takes 5 times longer without one. It’s an investment for sure, but not a huge one. You can pick it up from Sur La Table for $80. 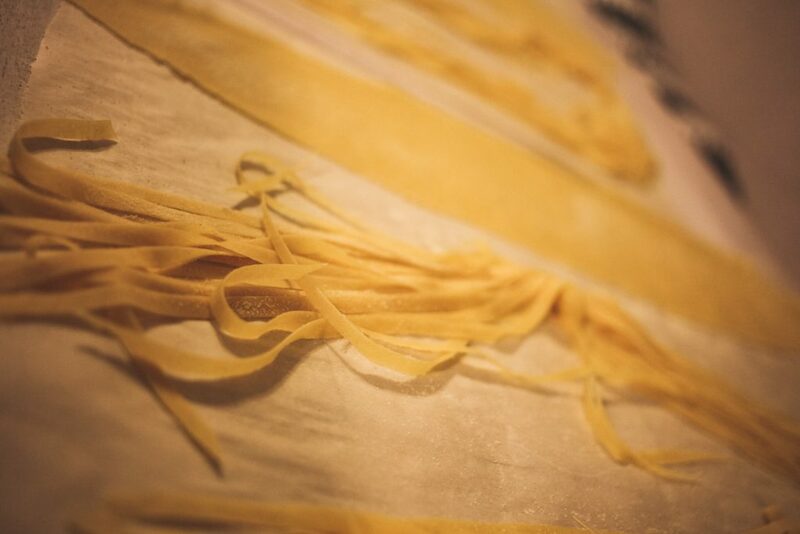 You shouldn’t really let the pasta sit folded like this or it might stick together, but it made such a nice picture! Pass the pasta through the machine, gradually making it thinner and thinner. Dust a bit of semolina on the pasta sheets. 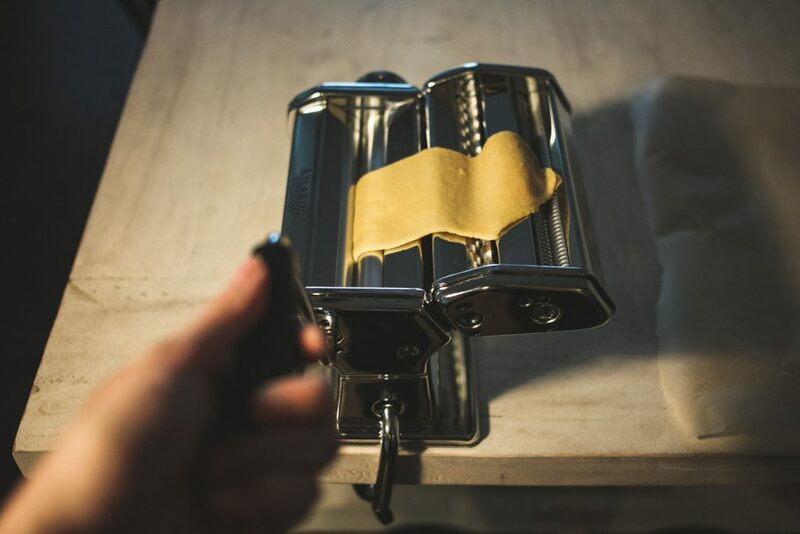 After the sheets have dried a bit (5-10 minutes), you will pass the sheets through the pasta cutting side of the machine. I don’t have a drying rack, so I just lay the pasta flat on a bit of parchment paper. And it’s ready to go! To cook the pasta it just needs about 7-8 minutes in well salted and olive oiled boiling water. This particular night I chose to make a simple alfredo but the possibilities are endless! Hopefully you will notice a HUGE difference in the pasta. 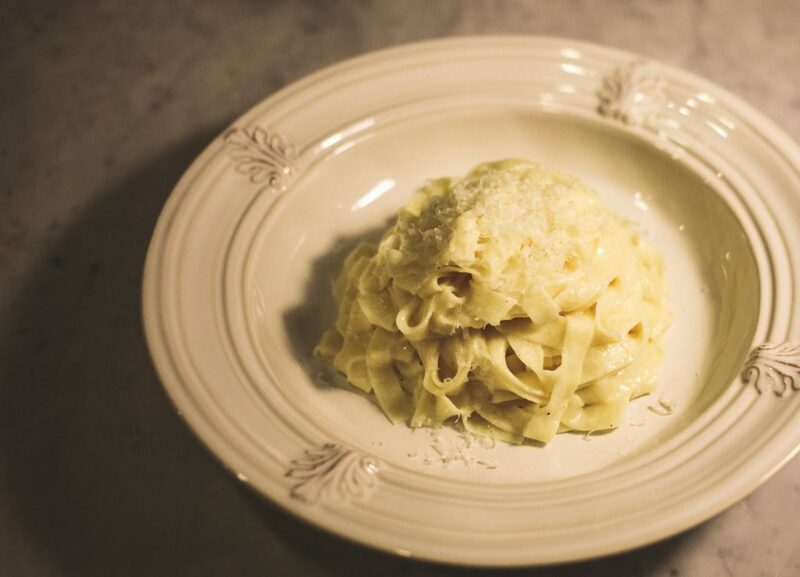 The pasta is soft and delicate and you can definitely tell it is fresh! 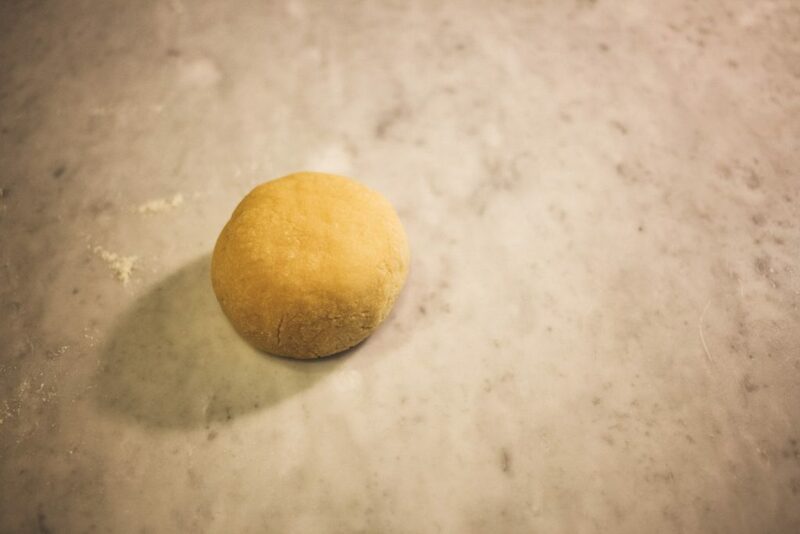 Mix together the flour and semolina and create a mound on the counter top with a crater in the center. 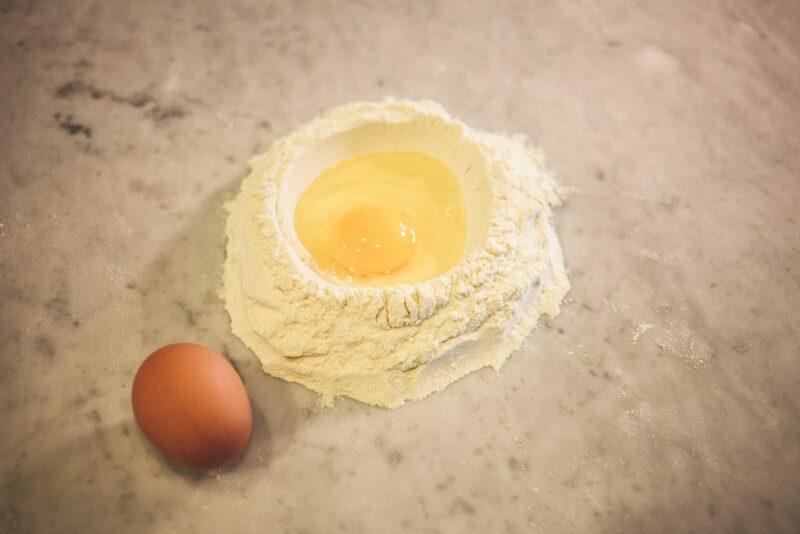 Crack the eggs into the center of the flour and semolina. Use your fingers or a fork to gradually draw the dry ingredients into the center, mixing them with the eggs. 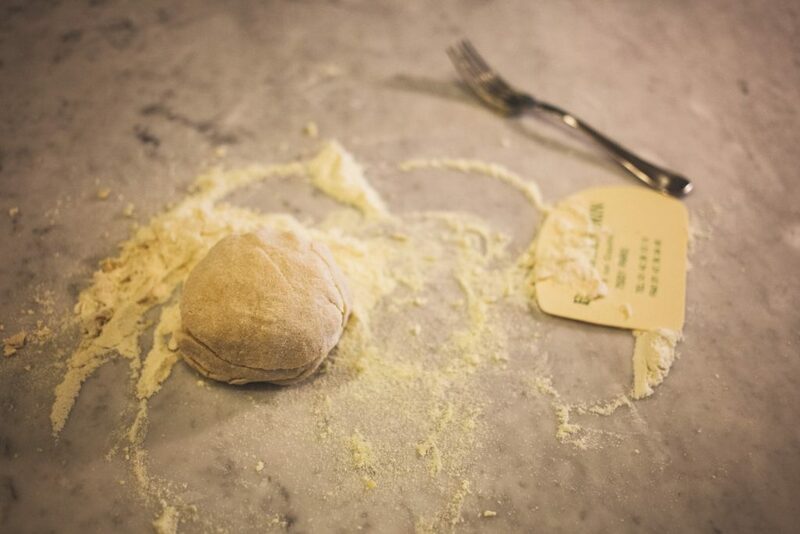 The dough will be hard to mix at first – a pastry scraper will help you draw it all together – but eventually it will come together and be relatively smooth. Knead the dough with the heel of your hand for 5-10 minutes until the dough is very smooth. The dough should not feel sticky. If it sticks to your fingers, knead in a small amount of flour, just enough so your fingers come away clean when you pull them away. 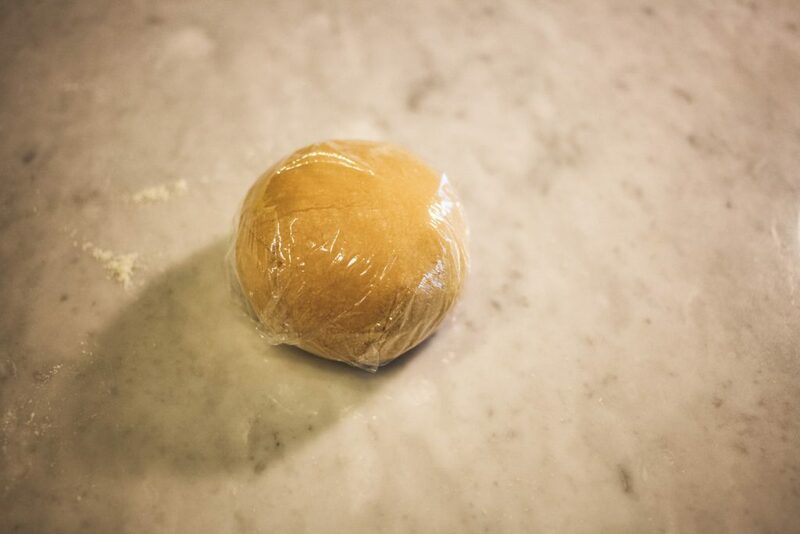 Wrap the dough and let it sit at room temperature for an hour.